Another retired general coming from the Bureau of Customs Intelligence Group (IG) in Manila is the replacement of dismissed BOC Davao District Collector and retired Gen. Ernesto Aradanas. He is retired Gen. Ricardo “Boy” Butalid. BOC Davao public information and assistance division head Suharto “Jun” Sumayan said last Friday afternoon that Butalid is expected to arrive and meet BOC Davao officials and employees today, Monday, Oct. 20. The BOC Davao’s top post was temporarily held by BOC Davao deputy collector for administration-operation Atty. Dante Maranan as the OIC district collector when Aradanas left the post last Monday after receiving the termination order of Dept. of Finance Secretary Cesar Purisima. Aradanas last Tuesday in press statement said that he did not resign even as he asked for impartial probe citing there was no of due process on his termination. Sec. Purisima terminated his contract of services with the BOC, coming on the heels of the foiled oil smuggling in the sub-port of General Santos City in the first week of last September. Aradanas allegedly allowed the entry of a shipment of smuggled gasoline of about 260,000 liters, which was subsequently pilfered of 163,000 liters under contentious circumstances which he vehemently denied making wrongdoing even as he thoroughly explained his actions as proper and legal that led to his late issuance of the writ of seizure and detention (WSD) last Sept. 23 per his chronology report that he bared to the media. The shipment was seized in a raid by composite force of the Philippine Coast Guard elements and Customs Intelligence and Investigation Services (CIIS) special team deployed by BOC Deputy Commissioner for Intelligence Jesse Dellosa. Butalid, like Aradanas, is a classmate, mistah of Dellosa under Class ’79 of the Philippine Military Academy (PMA). Aradanas joined the BOC after being hired as “Project Manager 3″ at the Office of Revenue Agency Modernization (ORAM) at the Dept. of Finance. The BOC is under the DoF. ORAM is the source of retired generals who are tapped to become project managers of BOC like serving in mission-critical posts such as the plum post of the district port collectors. They are employed under contract of services. Sumayan said that Butalid also came from ORAM . Per online research, Butalid ran for congressman in first district of Masbate last May 2013 polls but lost. Late last month he joined the BOC IG per backing of Dellosa, whom highly placed sources said carries “great weight” in the selection of officials he wants to serve with him in the IG. Butalid was the former chief at J6 (Communications, Electronics and Information System Service) of the Armed Forces of the Philippines (AFP) before his retirement in 2011. He was groomed by Dellosa to become the CIIS national director, but before he could get his due appointment the vacancy of the post of Davao port collector suddenly came up last week, although Commissioner John Sevilla signed the termination order of Aradanas last Oct. 1. The IG has direct supervision over the CIIS. It was the IG that uncovered the so-called smuggling “pipeline” between Malaysia and the Philippines starting from Sabah and ending up at various ports in Mindanao, with the apprehension of a local carrier loaded with 260,000 liters of smuggled gasoline at the sub-port of General Santos last September 6. 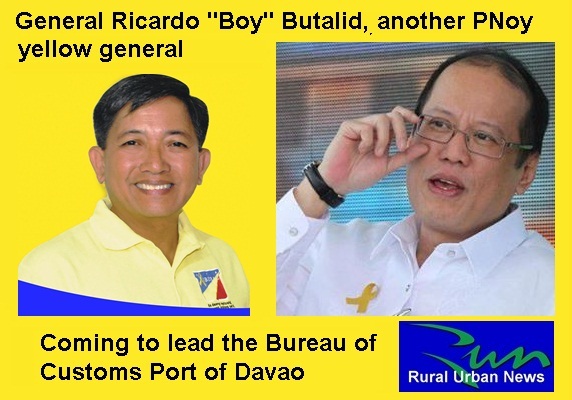 This entry was posted on March 20, 2016 at 12:53 am and is filed under BOC Davao Collector Gen. Ricardo “Boy” Butalid with tags BOC Davao Collector Gen. Ricardo “Boy” Butalid. You can follow any responses to this entry through the RSS 2.0 feed. You can leave a response, or trackback from your own site.